It is that time of the Premier League season now where teams are starting to get desperate for results. This makes for some great soccer to watch, but also makes every match that much more difficult to predict. In the week 31 matches there were some very interesting results that saw quite a shake-up in the EPL table, particularly at the top. A loss for Manchester City gave added momentum for their rivals Manchester United as well as for Arsenal with both teams going above the current EPL champions. Chelsea maintain their lead at the top, with a seven point cushion and a game in hand, while little has changed in the bottom three despite wins from QPR and Leicester. The shock wins over the weekend from teams like QPR, Leicester, and Crystal Palace have changed things quite a bit. For one thing, it makes it very difficult to know what to predict from here till the end of the season. Wins like that can really galvanize a team and create a positive vibe leading to additional wins. On the other hand, soccer is a very fickle sport and a win one week does not necessarily mean a win will come in any successive week. With all of the goals being scored in last weekend’s set of matches it is difficult to make predictions about which teams will keep clean sheets. I know that this is always helpful for fantasy Premier League owners, but there are some excellent keepers out there that can be found on Togga’s goalkeeper rankings. The problems with the matches this weekend is that there are several teams that seem to have checked out and aren’t really competing for much of anything. Newcastle United and West Ham United seem to fall into this category while Hull City seems to have very nearly given up as well. The Tigers need wins to stay out of relegation, but they certainly didn’t look like a team wanting to win against Swansea. Swansea and Everton face off to open the weekend in what will probably be a rather cagey match. Both teams are safe in that they aren’t going to be relegated and neither team is playing for a European place in the table. I’m predicting a draw, but realize that this is one of those matches where anything can happen. I’m predicting a draw for Leicester and West Brom. Tony Pulis and the Baggies will be looking for a response after last weekend’s defeat, but Leicester City are looking like a team that is not going to give up any time soon and will make this a difficult game. Tottenham and Liverpool should both come away with wins and keep pushing for that fifth place spot. Just behind them Southampton have hit a bit of a wall. They have the best goal difference of any team between 5-10 in the table, but their draws and close defeats have added up. They should manage a win this weekend against Hull, however. Arsenal and Chelsea face relegation fodder in Burnley and QPR and should pick up away wins, but I don’t expect either game to be an easy one for the top two EPL teams. With Crystal Palace’s recent form of three wins in a row they look good to pick up all three points at Sunderland. Sure, the Black Cats just won the Tyne-Wear Derby, but that has been a one-off match these past few seasons. I know that this was the time that Sunderland pushed themselves out of the relegation battle last year, but I’m going with the in-form team here and predicting a Palace win. 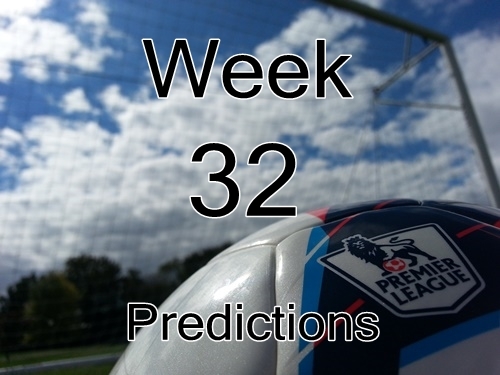 For the remainder of this week I am planning to work on a Manchester Derby preview along with my fantasy Premier League tips and weekly rankings, so keep coming back and don’t forget to follow the blog over on Twitter.